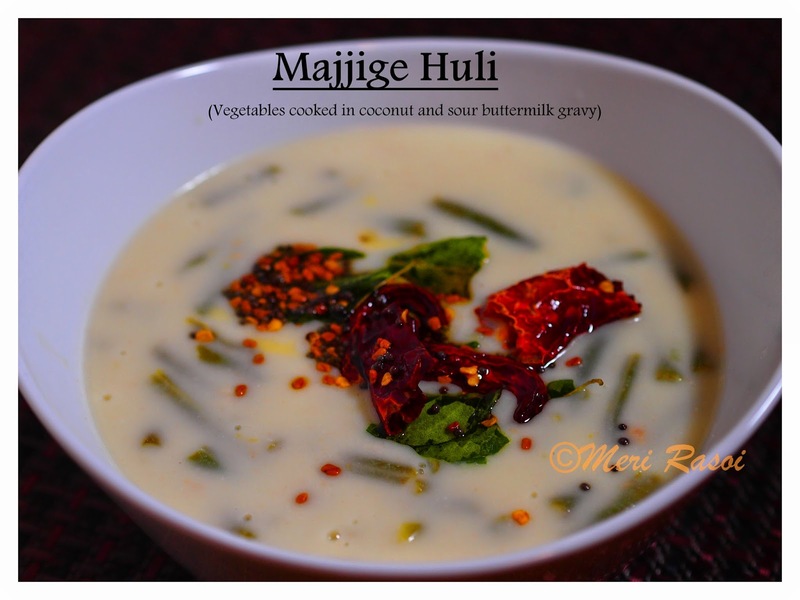 "Majjige" in Kannada (Language spoken in the Indian state of Karnataka) means Buttermilk and "Huli" in Kannada ( in this context) means coconut based curry. In Tullu (another language spoken in South kanara region of Karnataka) , it is called KODAKYANA. This a mildly flavored curry that not only tastes great with rice but also with Idli and shyavige (rice noodles). Heat 2 cup of water in a pot. Add washed, cleaned and cut green beans to it. Also add turmeric and some salt. Cook the green beans until done. Grind together grated coconut, green chillies and semolina into a smooth paste using little water. When the Green beans have cooked, add in the ground mixture. Mix well. Lastly add the sour buttermilk. Adjust the consistency of the curry. Also add required amount of salt (remember we added a little salt while cooking the green beans). Bring it to a boil and turn off the heat. To prepare the tempering, heat ghee/clarified butter. When hot, season the ghee with fenugreek seeds,mustard seeds,dry red chillies and curry leaves. Add the tempering to the curry and serve with hot rice. Tastes great with spicy cubed potatoes. ** If you don't have buttermilk, you can use sour yogurt. Whisk it well before adding. If the yogurt is too thick , add some water while whisking. 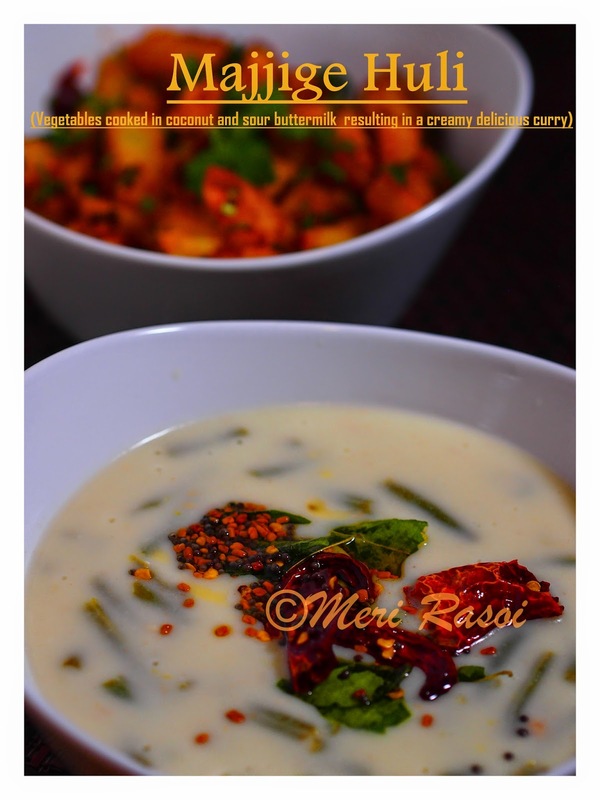 Also,if the buttermilk or yogurt is not sour, you can add some tamarind while grind the coconut mixture. 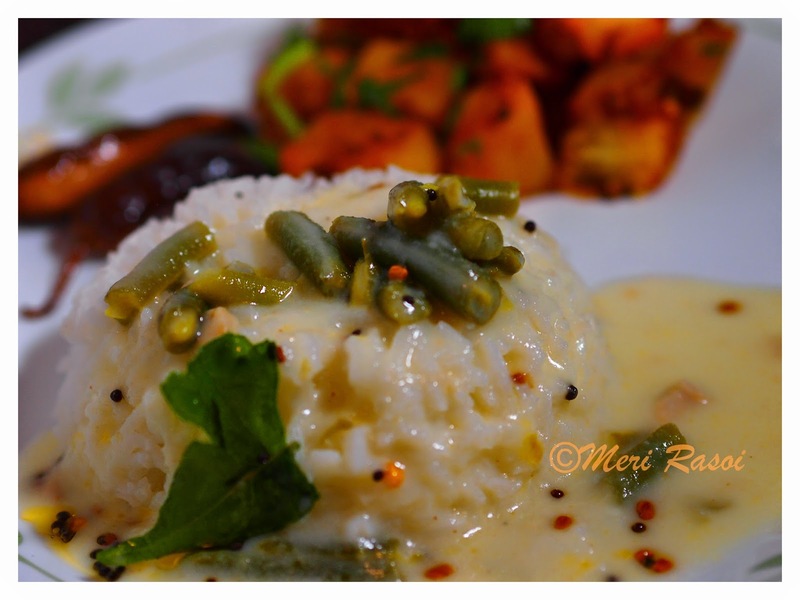 *** For a richer and creamier taste, use 2 tbsp of cashews instead of semolina and grind it with the coconut mixture. Adding.. Semolina..is new to me.. Nice..Adding rava is new to me! Thanks!! Adding semolina is my mum's method. Some people add rice instead.. Tempting like crazy. Love the explosion of flavours. That looks so yummy! I'll have to try it!! Lovely blend of flavours....adding semolina is new to me! !